Concrete floors are completely customizable and provide a great alternative to traditional flooring such as linoleum, carpet, wood, tile, stone or marble. Color choices, textures, patterns and finish options combine for limitless design possibilities. Plus, concrete is extremely durable, long-lasting and easy to maintain. If your home or business has existing concrete subfloors, exposing them and applying a decorative treatment is an affordable and environmentally friendly option. Concrete Floor Pictures Browse hundreds of concrete floor photos in kitchens, living rooms, business lobbies and more. Concrete Floor Cost Find out average prices and what design features contribute to the cost of concrete flooring. Concrete Floor FAQs Get answers to common questions about the comfort and maintenance of concrete floors. 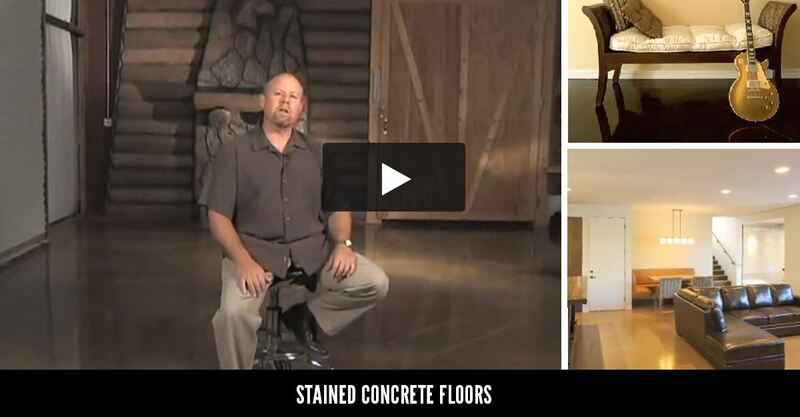 Concrete Floor Videos Watch 68 videos with design ideas, and installation & maintenance tips for interior concrete floors. 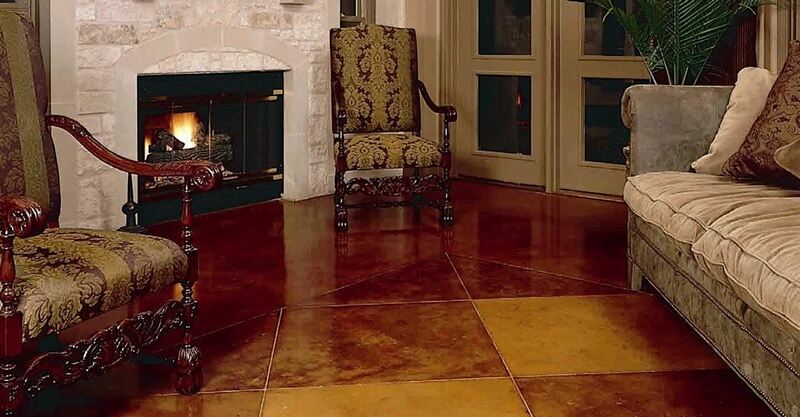 Stained Concrete Floors Get professional tips and design ideas for using stains to enhance concrete floors. Polished Concrete Learn how polishing produces concrete floors with a high-gloss finish that never needs waxing. WHERE ARE CONCRETE FLOORS USED? No other room gets as much use as the kitchen, so it needs to have the most durable flooring surface possible. Concrete can withstand the foot traffic and elements that kitchen floor surfaces are exposed to, while also bringing endless design options to the table. Plus, there aren’t any joints or grout lines to trap dirt or spills, so clean-up is a breeze. See more about kitchen flooring. Stained floors extend throughout the main level of this custom home. Hyde Concrete in Pasadena, MD. Make a great first impression with a stylish entry, foyer or mudroom decorative floor. Concrete’s easy care, ability to handle heavy foot traffic and resist staining make it the perfect choice for busy areas where dirt, mud and water might get tracked in. Read more about how to create a grand entrance. When deciding on flooring for a bathroom, you want something that is stylish, durable, resistant to moisture and spills, as well as low maintenance. Concrete checks all of those boxes. Radiant heating can also be installed to keep the floor comfortable for bare feet. Learn more about bathroom flooring options. 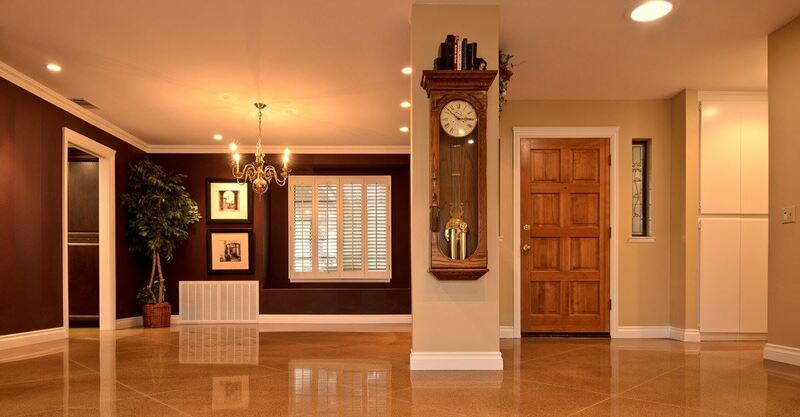 Concrete is an exceptionally good choice for basement flooring due to its moisture resistance in these areas that are typically subject to ground moisture and possible flooding. With concrete, you can avoid mold and mildew problems and having to pull up and replace damp carpet or damaged wood flooring. Add a fun feature of hopscotch or shuffleboard into the design. Check out more ideas for basement floors. With many garages being used as extensions of living space, why not make them as attractive as the rest of the home. Looks can range from sealed or polished basic gray to more complex color combinations. Add colored flecks for a terrazzo look or a custom design with brightly colored epoxy coatings. See more garage flooring options. Concrete combines durability for heavy use, high-traffic areas with endless customization options. These two factors combine to make it a perfect choice for retail stores, restaurants and bars, offices, churches, schools, medical institutions, and industrial buildings, making it possible to incorporate your company logo, colors or theme right into the floor. See more on commercial applications. Concrete flooring has many benefits, compare them to the drawbacks below to determine if concrete is the right option for you. 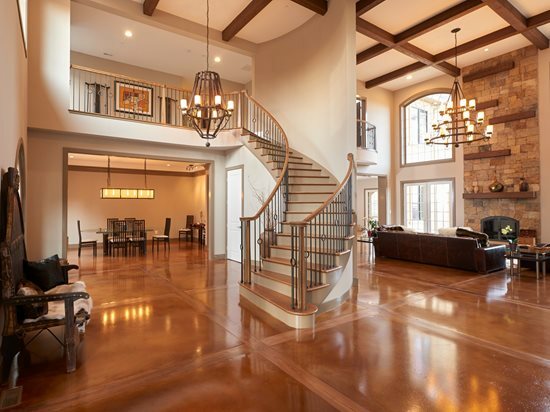 One of the major benefits of decorative concrete flooring is its affordability when compared to other options, particularly if you already have a concrete slab that’s ready for staining, polishing or application of a coating or overlay. The cost per square foot for a basic concrete floor is comparable to linoleum, vinyl, carpet or lower-priced ceramic tile. Mid-range designs are comparable to laminate, bamboo, hardwood and more expensive tile. Higher-end designs are about the same as slate, stone, or marble. The above pricing is based on basic installation in a square area. Factors such as cabinets, cut-outs, angles and stairs can contribute greatly to cost variances. Decorative concrete flooring can increase the resale value of a home, because new owners can install their preferred flooring right over the top without incurring removal and disposal costs, or choose to keep the concrete as is. The long-term value should also be considered, as concrete will provide decades of use with very low maintenance, saving you money over the lifetime of the floor. Confirm with your contractor exactly what is, and isn’t, included. The most popular color choices tend to be neutral grays and earth tones; however, the possibilities are nearly limitless. Color can be mixed into the concrete (integral color) or applied to the surface with stains, dyes, epoxy coatings, tinted sealers or with a combination of one or more of those methods. Concrete can be colored so naturally that it blends seamlessly with other elements in a room. Staining floors is incredibly popular because of the warm, earthy tones the stains impart. Looks can be achieved to replicate marble, wood, brick, stone and more. Acid-based stains are available in earth-toned palettes and water-based formulas offer a broader range of color options. The concrete in this home office was colored and polished for a one-of-a-kind flooring solution. Liquid Stone in Warminster, PA. Create the ultimate no-wax floor with polished concrete. Various levels of sheen from satin to high-gloss can be achieved through this multi-step process. Create an industrial look with polished natural gray concrete, or combine the numerous coloring options for an endless list of possibilities. In addition to colors and finishes, there are countless design possibilities that can be applied to concrete floors. Stamps and texture skins can be used to produce finishes that resemble wood, stone, brick, and more. You can create a look that resembles tile or score a design right into the surface with saw cutting. Logos and graphics can be incorporated with stenciling or engraving. If your existing surface has minor flaws or cracks, these can often be camouflaged or worked right into the design by skilled contractors, or simply used to add character. This dust-free heating method can be installed in newly poured concrete or with an overlay. Radiant heat is especially beneficial to those suffering from respiratory issues and allergies because air isn’t forcefully blown throughout the house and outside air isn’t brought in. You’ll also enjoy the added benefit of saving money on heating costs. If your concrete floor has minor imperfections, stains, or cracks, an overlay or microtopping might be the answer. Properly installed overlays are just as durable and long-lasting as standard concrete. Stampable overlays allow you to apply stamped or textured finishes, colors, and stains just as you would to newly poured concrete. There are even overlay products that allow you to cover vinyl, tile or wood surfaces. Read more about making the switch to concrete. Learn more about interior floor finish options and design ideas. The maintenance needs of concrete floors depend upon the amount and type of traffic it receives, but with minimal upkeep, your concrete floor will provide you with decades of use. Your contractor can recommend a maintenance schedule that fits your surface and location. When decorative floors are installed, they should be sealed properly. A good interior floor sealer will prolong the life of the concrete, provide protection from scuffs and stains, prevent moisture problems, as well as enrich the color and enhance the shine of the floor. Your contractor can recommend the best sealer for your particular application. If the floor receives heavy foot traffic, such as in a restaurant or retail store, a concrete floor wax can be applied occasionally as a sacrificial layer to preserve the sealer and protect the integrity of the floor. This top layer absorbs daily wear and tear and is easier to buff out and reapply than sealer. For properly sealed residential floors, a basic cleaning routine of sweeping and damp mopping is enough to keep the floor in top condition for years. For an occasional deeper cleaning, use water and a pH-neutral cleaner. Door mats and area rugs also help protect high-traffic or spill-prone areas. 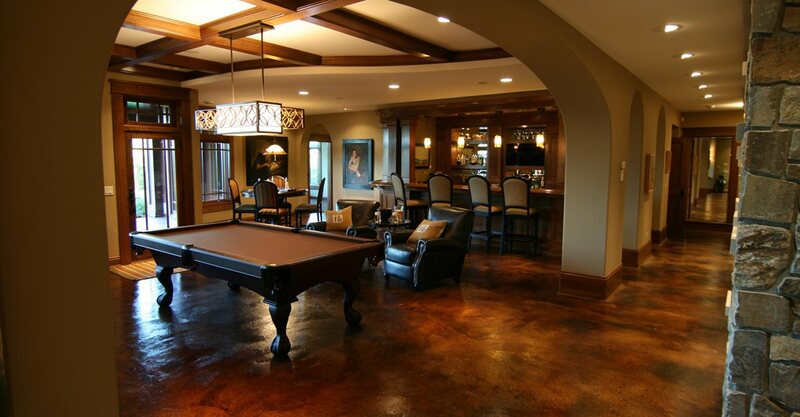 Read more about caring for decorative concrete flooring. Daily dust mopping will keep particles off the floor and protect the surface from abrasion. Because of the densification that occurs in the polishing process, polished surfaces don’t require sealers or waxes. They can get dull with years of high-traffic use, but buffing the surface can restore the original shine. Learn more about maintaining polished floors. Unfortunately, one of the drawbacks of decorative concrete flooring is the inability to easily repair or patch it. The texture and finish of the concrete, as well as the color and tone of the stain all need to be matched. This can be quite difficult, as each batch of concrete will cure and take stain differently. However, there are options such as working the patched area into the current pattern or creating a new design with a stencil or engraving. An overlay or microtopping can be applied, or as a final option, use a throw rug or furniture to hide the area. Consult an experienced floor contractor for advice.